Darn. Being a diebetic is kinda hard. You know what I mean? So what do you do when you really crave brownies and want to try to stay on track without spiking the blood sugar? My husband wouldn’t enable my bad behaviour, either. He’s gained too much weight, so he refused to “beg me” to bake a batch of the classic Baker’s one-bowl brownies. Another truly wonderful thing about my darling Chad is the way he’s always willing to dispose of my experiments, even when they fail. In this case, the brownies turned out to be the perfect blend of fudgey, dense and chewey without being too sweet. They didn’t rise much, but I can live with that. This recipe is adapted from the One Bowl Brownie recipe I found on Pinterest. 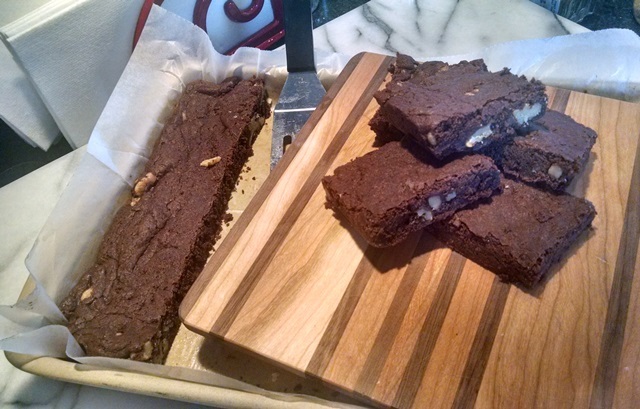 http://www.livingwellspendingless.com/2014/04/16/one-bowl-brownies/#Hpu4vl56mQ0Wlsbr.32. Preheat oven to 350 degrees F (if you have a double oven use the small one). Grease a 13×9 pan. I used a Pampered Chef stoneware bar pan, sprayed with Pam and lined with waxed paper. Melt 2 cups semi-sweet chocolate chips and 1/2 cup butter in the microwave on high for 3-4 minutes, until melted and stirs smoothly. Add 2 eggs, beaten, and 1 tsp. vanilla extract. Stir in 3/4 cup brown sugar (darker the better) and 1/2 cup Splenda (bulk) sweetener. In a small bowl, stir together 1 cup flour, 1 tsp baking powder, 1/2 tsp Kosher salt, 1 tsp cinnamon and a VERY SMALL PINCH of cayenne pepper. Stir these ingredients, then add them to the chocolate mix. Stir until blended. Fold in 1 cup whole walnuts. Spread the batter in the prepared pan. Bake 25 minutes until the top is dry to touch and starts to feel firm. Cool before slicing. Serves about 16, depending on how you cut the brownies. These brownies are thin. I think you could double the flour mixture and add another egg, but they would be more cake-like. Not what I was going for. Chad and I agreed these were perfect. I love pumpkin. When Thanksgiving gets close, the grocery stores stock up on canned pumkin. They don’t carry much of it the rest of the year, so I go nuts and buy a couple of cans every time I shop. It doesn’t go bad, right? So I end up with LOTS of cans of pumkin over-running my pantry. I’ve been experimenting with different ways to use it up. What’s wrong with experimental cooking? As long as nobody gets hurt, right? My husband is a champ. He will try everything I invent, even if he doesn’t like all of it. He doesn’t care much for pumpkin, but he’s learned to trust me. I disclosed up front that yesterday’s oatmeal had pumpkin in it, and he at it, anyway. His philosophy is that if you put enough brown sugar in a dish, it will be all right. Bring the water to a boil in a 3-5 quart saucepan. Add the oatmeal and spices. Stir, reduce heat to simmer, cover and cook until the water is absorbed (about 15 minutes). Stir in the pumpkin, apple, nuts and sugar. Simmer another 10 minutes until the apple is soft. Stir in the eggnog and serve hot. Yes, I created a holiday soup. Actually, I got a little heavy-handed with the spices and needed a way to cool it down. Plus, I had more eggnog in the ‘fridge than I could drink, because Hubby doesn’t like it. Problem solved. Did you know that pumpkin and eggnog go together really nicely? s. Taste it, and adjust the seasonings to suit. It should be very spicy, but don’t panic. This is where the eggnog comes in. Stir eggnog into each serving to: cool the soup to a perfect temperature for sipping; drop that spiciness; cream up the soup; and, add the perfect complimentary sweetness to all that pumpkiny flavor. I tossed in a handful of my sister’s crunchy cheese straws and had the perfect winter warmer. No all-pumpkin feast would be complete without dessert, right? Reprised from an earlier post, here are the pumpkin chocolate bars.